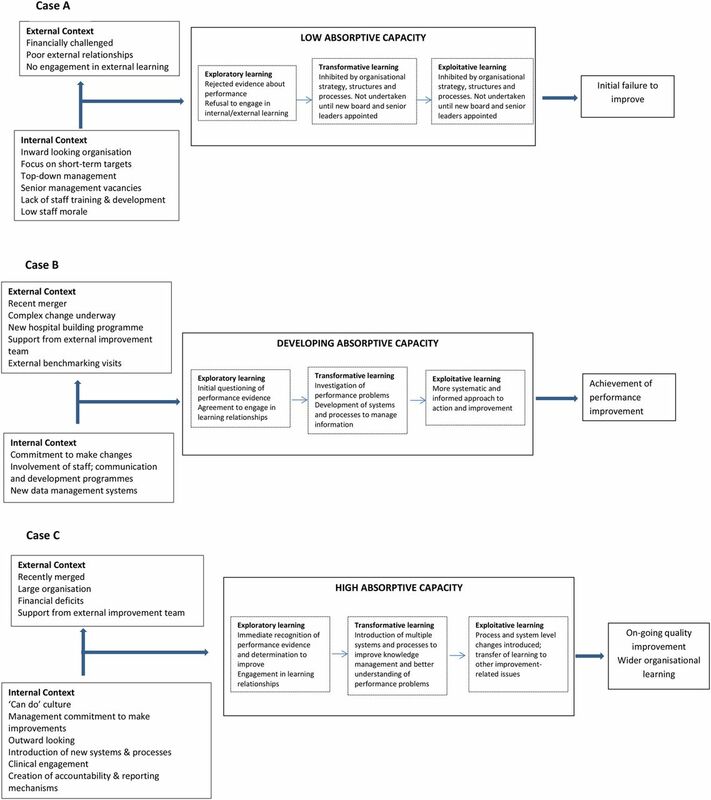 Background Organisational context is frequently cited as an important consideration when implementing and evaluating quality improvement interventions in healthcare, but limited guidance is available on which aspects of context are most influential or modifiable. This paper examines how internal and external contextual factors mediate organisational-level performance improvement through applying the knowledge-based theory of absorptive capacity (AC). Methods Three healthcare case studies are presented. Each case is a UK National Health Service organisation that had been identified as having performance problems. Qualitative data were collected through semi-structured interviews with general and clinical managers within the organisation and members of external teams supporting or overseeing performance improvement (n=22). Interview data were analysed using an existing AC framework from the literature. Results The organisation with the highest AC showed the quickest and most comprehensive performance improvement. Internal characteristics including strategic priorities, processes for managing information, communication and orientation to learning and development impacted on the organisation's ability to engage successfully with external stakeholders and make use of available knowledge. This enabled the organisation to thrive despite the challenging external environment. Lower levels of AC appeared to delay or limit the improvement trajectory. Conclusions Developing a more detailed and nuanced understanding of how context influences improvement is an important step towards achieving more effective and sustainable quality improvement programmes in healthcare. AC, with its focus on knowledge and organisational learning, provides a useful way to explore the relationship between context and quality improvement and represents a potentially valuable area for future research and development. This paper aims to extend and develop our understanding of how ‘organisational context’ affects the implementation and effectiveness of improvement in healthcare organisations. We focus on performance improvement at an organisational level and on the use of knowledge to inform and implement improvement. Our starting premise is that context matters through determining the organisational capacity to make effective use of available knowledge to improve performance. This line of argument draws on the relevant business and management literature. In particular, we focus on the theory of absorptive capacity (AC), which suggests that contextual factors—both external and internal to the organisation—mediate the way in which the organisation is able to manage and process knowledge to improve performance. The paper starts by briefly exploring what is already known about the contextual factors that influence the implementation of improvement initiatives in healthcare and the role of knowledge management and organisational learning in performance improvement. We then describe the theory of AC, drawing on recent debates and applications in the public sector, including our own empirical research in healthcare. Ovretveit (ref. 3, p.i18) defines context as ‘all factors that are not part of a quality improvement intervention itself’, and various authors have developed taxonomies, theoretical and conceptual frameworks to delineate key elements of context that influence the success of quality improvement initiatives.2 ,4 ,12 Typical aspects of context highlighted in such frameworks include leadership, organisational culture, teamwork, resources, organisational characteristics and various external environmental factors. The mechanisms by which such factors exert an influence and the relationships between different factors are generally less clear. Since early seminal work to describe the concept of AC,22 ,23 it has received considerable attention in the management literature on learning, innovation and performance; over 1200 publications on AC appeared in the literature between 1992 and 2005.24 Lane and colleagues25 undertook a critical review of the literature on AC, describing it as a three-component process of exploratory learning, transformative learning and exploitative learning (table 1). Exploratory learning is a process through which an organisation comes to recognise and understand new knowledge. Transformative learning refers to those processes that affect the way in which new knowledge is assimilated and combined with prior knowledge at different levels within the organisation. Exploitative learning is the process by which the new knowledge that has been assimilated is translated into actions that will benefit the organisation, for example, through the implementation of agreed plans or policies and the introduction of necessary changes. This same review proposed that AC is determined by two sets of antecedents that are external and internal to the organisation25 (figure 1). External factors include the environmental conditions, characteristics of knowledge and characteristics of learning relationships. Internal factors relate to mental models, organisational strategies, and structures and processes within the organisation. Interaction between these factors influences the way in which the organisation approaches the key stages of AC; in turn, this determines the performance outcomes of the organisation, in terms of management focus, governance and improved services. Absorptive capacity (AC) framework (adapted from Lane et al25). Although much of the literature on AC focuses on achieving competitive advantage in industrial and commercial organisations, there is a growing interest in its application to the study of public sector organisations.28–32 Market reforms coupled with an increasing focus on external performance assessment and regulation has accentuated the need for organisations to achieve and maintain high levels of quality in an increasingly competitive environment. In this paper, we focus on three healthcare case studies we conducted, two in England and one in Scotland. Each organisation had been identified as having performance problems through external inspection or review of their performance data and a formal improvement programme had been put in place. Primary data collection involved semi-structured interviews with middle-level and senior-level managers exploring the history of the performance problem and how it was being addressed. Interviewees included a mix of general and clinician managers and at least one external stakeholder involved in managing the performance of the organisation or providing external improvement support. Twenty-two interviews were conducted in total; 7 in two of the cases and 8 in the third case. The interviews were conducted by two members of the research team (GH and PJ), and each participant was interviewed once only. The interviews were digitally recorded, transcribed and analysed using the Lane et al25 conceptualisation of AC (figure 1) as an analytical framework. Supplementary documentation in the form of inspection reports and agreed action plans for improvement was also made available to the research team; this was used to inform the background description of the cases and the organisational response to performance data. Case A was a small organisation with a small management team, operating within a financially challenged health economy. The organisation did not immediately respond to the evidence about the need to improve performance and could best be described as an organisation in denial. It had failed an external clinical governance review and not met national response-time performance targets. An external improvement team had been appointed to work with the organisation over a 12-month period. The board and senior leaders of the organisation initially rejected the evidence that their performance was poor and refused to cooperate with the external improvement team. From an AC perspective, case A never got beyond the point of acquiring evidence about its performance; this evidence was not accepted, which removed the potential for assimilating and acting upon the evidence to bring about improvement. Case A typified an organisation with a low level of AC. This illustrates the steps the organisation took to improve their AC through introducing internal systems and processes to address the assimilation of new knowledge and its application. This was supported by other internal factors such as development programmes for staff to support the changes that were being introduced and new communication systems to disseminate information from the chief executive to staff throughout the organisation. Over a relatively short time frame, this resulted in a clear improvement in organisational performance. As a result of this package of changes, the organisation witnessed improvement in achievement of the targets; rates increased from <50% to >90% within 12 months. The prevailing view was that the improvement programme had sharpened the organisation's thinking about the need to ‘drive a process’ rather than ‘letting the process meander around’, which in turn created organisational learning beyond cancer services. The cases demonstrate how varying levels of AC resulted in different processes and outcomes of improvement; they also begin to shed light on how contextual factors can influence the improvement trajectory. All three cases experienced a challenging external environment with financial constraints and changing external conditions. Cases B and C had both experienced recent mergers, resulting in larger, more complex organisations, bringing together different cultures and different ways of working. Yet these two organisations displayed higher levels of AC than case A, suggesting other external and internal factors exerted a more significant influence on AC (figure 2). Summary of cases from an absorptive capacity perspective. In case A, most of the internal and external factors inhibited the development of AC. In a challenging external environment, the organisation had poor external and internal relationships, a closed culture, an autocratic style of management and high numbers of management vacancies. Equally subject to difficult environmental conditions, cases B and C displayed contextual factors that promoted AC, including a willingness to engage in learning and external partnerships, management commitment to improve, investment in better IT and communication systems and support for staff engagement and development. Therefore, a difficult or challenging external context is not in itself sufficient to limit or inhibit the development of AC. Rather, a number of other internal and external factors can create and enhance higher levels of AC. Important internal contextual factors include the strategic focus and priorities of senior managers, the organisational culture and willingness to learn, the establishment of systems and processes to more effectively manage information and communication within the organisation and attention to necessary staff support and development processes. In turn, these impact upon external factors such as the extent to which organisations engage with wider stakeholders and are willing and able to make use of knowledge from external sources. It follows, therefore, that efforts to increase AC need to assess and then address the internal and external contextual factors that influence the processes of knowledge acquisition, assimilation and application and consider the order or sequencing in which specific issues are addressed. For example, if an organisation displays significant internal contextual barriers to AC (as in case A), then providing additional external information or access to external networks and expertise is unlikely to have much impact. Attention to the contextual factors within the organisation is a necessary first step to building AC and improving performance. This highlights the need for detailed assessment of organisational capacity to improve, and tailoring interventions appropriately, rather than seeking a generic solution to the issue of organisational improvement in healthcare. In our view, the distinctive and important contribution of AC is that it provides a conceptual framework that can be used to understand and even address the causes of variation in performance improvement, beyond simply describing or ascribing it all as a matter of organisational context. It promotes a view of the organisation as a knowledge processing entity that complements or even counters two more prevalent narratives: the actor-driven view in which organisational change and improvement comes about because of individuals and their leadership; and the methods-driven view in which organisational change and improvement are produced by following a particular procedural process of measurement, metrics and tools. Understanding the way knowledge is used in organisations may be particularly important in knowledge-intensive sectors or settings, such as healthcare. Further exploration of the contribution of AC to healthcare improvement, from both an organisational and a regulatory perspective, represents a promising area for research and development in the future. Equally, it is important to acknowledge the limitations of our research, which largely relies on interviews at a single point in time. Longitudinal observation of organisations as they attempt to manage and improve performance would provide richer data and help to further refine our understanding of AC. A better understanding of the relationship between context and quality and safety is an important priority on the agenda to learn from failures and both scale and speed up the implementation of effective improvement in healthcare. A better understanding of the contextual factors and processes involved in managing and improving organisational performance is important for a wide range of stakeholders throughout the healthcare system, including patients, clinicians, managers, policymakers and regulators. In this paper, we have discussed the application of a knowledge processing theory, AC, to analyse the concept of organisational context and its relationship to performance improvement. In doing so, we hope that we have contributed to the debate on why context matters in healthcare. We believe that by adopting a knowledge-centred approach to organisational learning for improvement we can move beyond the acknowledged view that ‘context matters’ to develop a deeper, more rounded picture of why performance varies within and between organisations and, more importantly, what can be done to facilitate improvement. We particularly acknowledge the contribution of Professor Chris Skelcher to the design and conduct of the study on performance failure in public sector organisations, from which the empirical data in this paper were derived.
. Understanding the conditions for improvement: research to discover which context influences affect improvement success. BMJ Qual Saf 2011;20(Suppl 1):i8–23.
. Service improvement in healthcare: understanding change capacity and change context. Clinician in Management 2007;15:61–74.
. Organising for quality: the improvement journeys of leading hospitals in Europe and the United States. Abingdon: Radcliffe, 2008.
. Organizational context for quality: lessons from the fields of organizational development and change management. Qual Healthcare 1998;7(Suppl):S8–15.
. Unlearning in healthcare. Qual Saf Healthcare 2004;13(Suppl II):ii10–15.
. The fifth discipline: the art and practice of the learning Organization. New York: Currency Doubleday, 2006.
. Organizational learning II: theory, method and practice. Reading MA: Addison-Wesley, 1996.
. Turnarounds. In: Faulkner DO, Campbell A. eds. The Oxford handbook of strategy. Volume II: Corporate Strategy. Oxford: Oxford University Press, 2002:267–318.
. Turnaround in healthcare providers. London: London School of Hygiene and Tropical Medicine, 2004.
. Is the resource-based ‘View’ a useful perspective for strategic management research? Yes. Acad Manage Rev 2001;26:41–56.
. Absorptive capacity: a review, reconceptualisation and extension. Acad Manage Rev 2002;27:185–203.
. eds. From knowing to doing: connecting knowledge and performance in public services. Cambridge: Cambridge University Press, 2010.
. Could do better? Knowledge, learning and performance improvement in public services. Final report ESRC Public Service Programme—Project grant # RES-166-25-0020. Manchester Business School, 2009.
. The Mid Staffordshire NHS Foundation Trust Inquiry. Independent Inquiry into care provided by Mid Staffordshire NHS Foundation Trust. January 2005-March 2009. Vol 1. HC375-I. Stationery Office, 2010. Contributors All authors contributed to the conception and design of the paper. GH prepared the initial draft and coordinated the process of editing and revision. All authors were involved in the reviewing process and read and approved the final manuscript. Funding ESRC Public Service Programme (grant number: RES-166-25-0020). Ethics approval Leeds (East) Research Ethics Committee reference 07/H1306/125.